She’s the backbone of the family; taking care of her over-worked mother, watching her brother’s back, reluctantly funding her father’s booze. Shabri (Isha Koppikar) an honest hard working slum dweller wants to lead a decent life and ensure an equally decent one for her brother and mother. Shabri lacks novelty and will not make its mark. Also given that there is no known male lead in the film, it will go largely unnoticed. Lack of promotion will only add to its tale of woes. Introducing a women in the land of Satya and Raghus of Bollywood, Shabri is a gritty, stark addition to RGV factory of gangster cinema. Though it treads turf that is familiar, Lalit Marathe shines in his debut as a faithful, snap, no nonsense narrator. 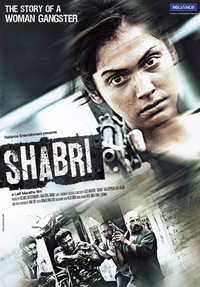 Shabri is worth a watch mainly for its brilliant performances and intense plot.